Funeral services for Lyniea Faia Demain, age 89, of Freeport Texas will be held at 6 PM on Friday, April 5th at St. Paul’s Episcopal Church, 1307 West Fifth Street in Freeport with Father Robert Dohle officiating. Burial will be on Saturday, April 6th at 4 PM at Adams Cemetery in Galloway. Visitation will be on Thursday, April 4th from 6 – 8 PM in the Parish Hall of St. Paul’s Episcopal Church in Freeport. 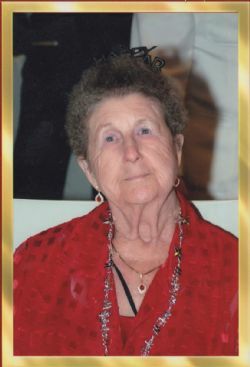 Faia was born on July 31st in Logansport, Louisiana in 1928 and died on Monday April 1st, 2019. She worked for Prudential Insurance in Houston for 6 years where she met her husband William Demain. They were married on February 10th in 1956 at St. Paul’s Methodist Church in Houston. They have lived for the last 59 years in Freeport, Texas. She is survived by her husband William Demain; daughters Sandra Leavey (Frank) and Diana Demain; niece Michaelle Canion; grandchildren Christopher Felder, Sarah McIntyre, Angel Demain-Leavey, Austin Zachary, and Anna Prochazka; and great-grandchildren Greyson McIntyre and Adelyn McIntyre. The family would like to thank close family friends Clifton Shimek, Mary Ellen Bartosh, and Margaret Jackson for their dedication and loving care during the final years of her life. Pallbearers will be Frank Leavey, Christopher Felder, Cliff Shimek, Austin Zachary, Nick McIntyre, and Gerry Bouchard with Honorary Pallbearer Antonio Carrillo. In lieu of flowers, memorial donations can be made to St. Paul’s Episcopal Church memorial fund. Local arrangements by the Turner Family at the Lakewood Funeral Chapel, (979) 297-6464. Burial arrangements by Hawthorn Funeral home in Carthage Texas. Online condolences may be made to the family at www.lakewoodfuneralchapel.com.